People often refer to porcelain veneers as “instant orthodontics” and “permanent teeth whitening.” The truth is that porcelain veneers can correct a significant number of cosmetic dental problems. A veneer is a thin, shell-like covering that fits directly over the front surface of a tooth, and each one will be handcrafted according to specific design instructions provided by Dr. Canzoneri. Normally, patients prefer that veneers be placed on the teeth that show when they smile. This includes, in most cases, about eight to ten teeth. Because they cover the entire front surface of teeth, veneers hide chips, stains, and misalignments; they can even change the overall shape and appearance of individual teeth! 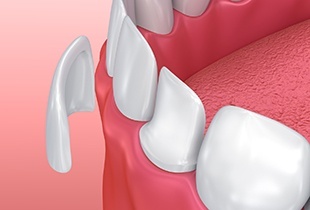 To place traditional veneers, Dr. Canzoneri must remove a small amount of natural tooth enamel. This allows the new veneer to lay flat and in line with surrounding teeth in order to create a natural appearance. Some cases allow for no-prep veneers, which require no tooth preparation before placement. Dr. Canzoneri only recommends no-prep veneers when they will result in a natural-looking smile. He’ll review your case and discuss with you the best option for your situation before proceeding with any treatment. The custom design Dr. Canzoneri creates for your porcelain veneers will take into consideration your skin tone, the shape of your features, and the information you provided in your smile analysis. To ensure that your veneers will fit properly and that optimal occlusion will be maintained, Dr. Canzoneri may create a diagnostic wax model of your mouth. You will be able to see both how your teeth look now and how they’ll look after your porcelain veneer procedure! Expect two or three visits for your entire procedure. At the first clinical appointment – after the initial consultation – Dr. Canzoneri will prepare your teeth for the veneers and take an impression for the dental laboratory. He’ll then send design plans for your new restorations, and a ceramist will handcraft each veneer to detailed specifications. You’ll wear temporary restorations while your veneers are being fabricated. At your second visit, Dr. Canzoneri will remove your temporaries and permanently affix the porcelain veneers in place. You’ll leave the office with a new smile and renewed self-confidence!